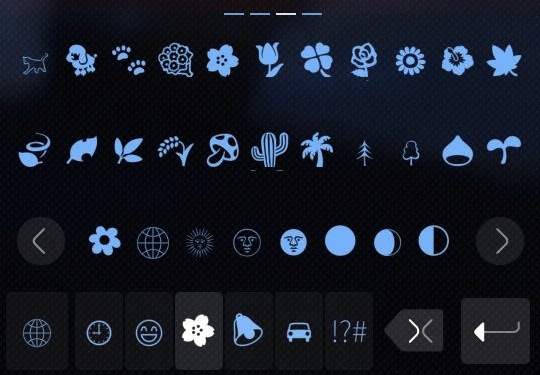 Emoji keyboard extension for SailfishOS with emoji font including full set of iOS 5+ and Whatsapp Emoji characters. 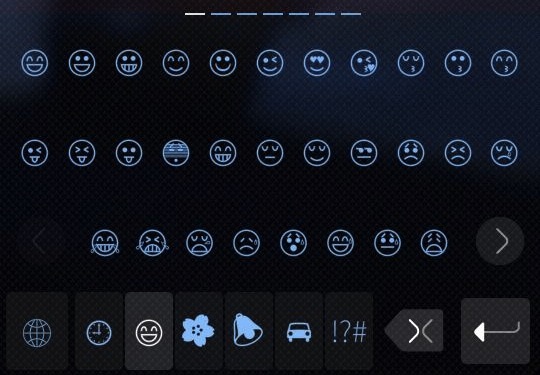 5) Test if you can now select Emoji keyboard layout. a) Open Settings > System > Utilities (if you have Sailfish Utilities installed) and select Restart Keyboard. Try again from step 3 or 5.
b) Restart your Jolla. Try again from step 3 or 5. 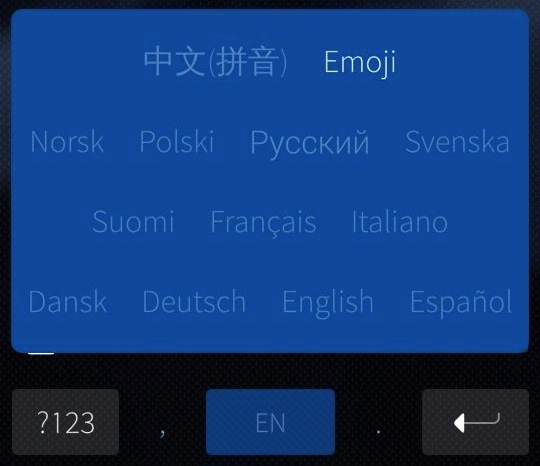 If Emoji fonts are not shown, then restart you Jolla. Privacy notice: Collects statistics using Google Analytics. Opt-out via settings. Updated to support SailfishOS 1.1.4.28 and verified to be compliant with 1.1.4.29. Not compatible with older version of SailfishOS. Use version 0.4.1-4 on older OS. versions or upgrade your SailfishOS to 1.1.4 or newer. Dependency issue with qtdeclarative fixed in installation package. Supports SailfishOS versions from 1.0.7.16 to 1.1.2.16. Do not try to install older packages on SailfishOS 1.1.4 or newer. If you however did and have now non-working phone please find out if instructions on issue 16 will help. Works flawlessly under SailfishOS 2.0.4.14 on my Jolla 1 phone. Thank you, this is still a well working, much needed under SailfishOS, really useful and nice addition. I cannot reproduce this issue under SailfishOS 2.0.4.14, see above. "Exit from settings works properly only when swiping on top of settings page"
Thanks for reporting this. I guess it applies to all other settings too meaning that something has been changed in sailfish os that prevents keyboard to retrieve (and store) it's settings. I will try to fix this as soon as I am back at home - by the end of week. I am not using Jolla anymore on daily basis and this I am not testing the keyboard with every update. Hello Pjenguin and thanks for the keyboard. Any change of getting more tabs or pages for the recently used emojis? Emoji does not work with Android apps; just tried it with WhatsApp and Facebook. I have a vague recollection that it used to work in some earlier Sailfish OS version. Now I am running 1.1.7.28. Thanks for your efforts, it's very useful in apps like SailorGram, Whatsup, SailGrande; but an update for compatibility with split-screen keyboard will be perfect. This is awesome. Something what should be done by Jolla already. This package does not seem to work on SailfishOS 1.1.4.28. I've installed this package trough Warehouse. keyboard-custom-common has been installed too. When enabled I can select "Emoji" but it does not change keyboard layout. I've tried to reboot twice, reinstall package and disable and enable the Emoji keyboard under Settings, but it's still unusable. Whatever the new "Split keyboard in landscape mode" is enabled or not makes no difference. I'm new to modding, but I'd built a custom keyboard for myself and I had to update it in order to make it work on upd13. It looks like there are some new/unsupported functions in the new version of maliit, so we should wait for Janne to fix it. I am working to get it fixed. I have some update issues and need to recover those first to get my testing phone working again. It's great that you'll be looking into it. If you need help updating your phone feel free to contact me (Contactform under my profile). Critical bug in Update 9: after going to settings, you cannot leave settings anymore. Swiping from left to right doesn't work. Now I'm stuck in settings and need to choose another keyboard in sailfish settings. After doing that I can enter emoji keyboard again. I have tested yesterday with Update 9 in fresh installation and I couldn't find above issue. Keybord works, keyboard selection works and return from settings works. I didn't do regression test with all settings options yet, but all tested features seems to be working properly. I've tested after update from 8 to 9 and still I can't reproduce the issue. I will however publish updated version later in which settings has been moved to separate application. That will still require more testing and there are some issues still to be solved before making it public. Installed and works just fine for me! I don't have extra phone to repeat that. Any screenshot available? Have you restarted phone after fresh install? Emoji keyboard adds emoji font into system and font installation requires reboot before font is recognized. Screenshot needed in order to help with this issue. Please test if version 0.4.1-2 would solve the issue. Not same issue. You have to enable it from settings -> System -> Text input -> Keyboards because of bug in previous release package post uninstall script. I'm sorry about this extra effort needed. Other solution is to reinstall 0.4.1-2 package. The opt-out doesnt work! Everytime i activate the emoji Keyboard it tries to call home. You can easily check this by disabling wifi and mobile connections and fire up emoji keyboard in the sms app. Jolla asks you to connect to the internet... If you go to the settings page, you will notice that "analytics" got reactived automatically. Why? Thanks for that keyboard. Really appreciated that you provide it. Keep up the good work!